Sometimes I feel like the 13 year old girl I was a hundred years ago. Really, how am I different than that gal? Am I different? I'm still funny, bossy, articulate, determined, and sometimes a brat. But, what has changed? 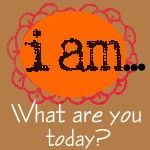 I looked at myself in the mirror a couple of weeks ago and said to my self -out loud- You are a grown-up! You are a grown-up? Really? Am I really? Sometimes I look at people, talk to customers, friends, classmates, and even strangers and think, man have they got it all put together; I can't wait until I'm all grown up too. According to some, I am. When I was a kid, it was obvious who the grown-ups were. The grown-ups got to do fun stuff all the time, go to the grocery store, buy new clothes, wash the car. Grown-ups got to sit at the BIG table at Christmas, no longer relegated to the baby table. Grown-ups have jobs, they pay bills, they are always busy. Grown-ups got to stay up late and watch TV, dance, and bang around pots and pans( that's what I thought my parents did at night after we went to bed, turns out they were just doing the dishes), they got to pick what was for dinner every night. Sometimes they would be pre-occupied with something "you don't need to worry about it". Lots of days they are grumpy, tired, and want things done the way they like it. Grown-ups, fall in love and get married. Grown-ups can eat cake for breakfast, drive cars, and are made of money. Well, here is the confusing part. I do those things (well, except for the made of money bit), but nothing feels different. How did that happen? Why do I still feel like I am playing house, still feel like I am working for more, longing for more "adult" responsibilities? What is this elusive MORE? The more I'm talking about isn't a cooler car, a bigger house, or trendier clothes. It is doing more, becoming more, a constant nagging thought. Sometimes I am paralyzed by the thought of becoming more. I know there is room for improvement, but somehow I am held back by what I used to know, who I used to be. I think I probably waste a lot of time being upset because I haven't DONE more. I am convinced at times that my artwork isn't up to snuff, that I will not be able to help anyone as an art therapist in the future, that I am too old to be doing any of this; I continually think about how far behind I feel when I look at other thirty-somethings. My dad and I have talked about this at length, and he always seems to be able to talk me off the ledge, but lately I am so wrapped up in this! I am frustrating myself. Right about now I am putting on my big girl pants, and am going to do something about this! More time and attention for me, less for folks who will just do what they do...no matter what I do. So much going on a la maison de mes parents lately. I'm trying to remain cool, calm, and collected (that is NOT my style). No matter what, my parents will love and accept me. This goes for my sisters as well. No matter what we do my parents will still love us. Not grow up to be what I thought they wanted me to be...when all they ever wanted is for me to be me. I can't think of a thing that I could do, or could have done to make them love me less. Oh, they get/got mad, but usually that was because the dishwasher wasn't emptied, or the trash wasn't taken out, but the big stuff; calm, often stern, but rational, thoughtful and supportive. It's good to know nothing's changed. Thank You Mommy and Daddy. "you'll never find yourself until you face the truth." p.s. GET A JOB while your at it. You're gonna need it. Sometimes I wake up and nothing feels right. Nothing really feels wrong per se, maybe just…off. That’s just how this morning felt. Maybe it was the complete and utter jubilation of the night before; leaving me feeling less excited about another ‘regular’ day. Maybe it was the PBR I was swilling; leaving me with a headache before I even woke. Maybe that’s just how this morning was going to feel no matter what. But, I don’t have to accept it. I decided to have a bit of meditation time to remind myself of a few things. Then, I put this affirmation together so it will be the first thing I see tomorrow morning. Tomorrow is going to be an "A day". Sending my love accross the universe today. There are all kinds of Mamas out There! If you didn’t know by now, my husband and I don’t have any kids. We won’t be having any either. I’m not going to go too far into it, just a combination of biological, emotional, psychological reasons. Maybe I just wasn’t made to be a mom. I’m an awesome aunt, godmother, and Dog mom so I’m okay with my situation. I am lucky enough to know a few of the best moms around: my younger sister is the lucky mom of two little girls and a son due in about two months, my best friend since 5th grade K- has 3 girls and my very close friend T- has a son and two daughters. I think these women are amazing, they work so hard to grow their families, and they each do it in a unique way. K- is a SAHM who spends every minute with her girls, they are funny, well rounded and smart. My sister works full time but makes every minute outside of work special for her girls, they are as different as night and day, but both girls are outgoing, smart and fun. T-works full time as a child advocate and even after an excruciating day in the office, she is able to make her time with the kids special. Each of her children is silly, intelligent and attentive. I think each of these moms knew from the time they were little girls that they would be mamas. I’m sure of it actually, and as different as each mom is, her idea of her perfect family differs just as much. I think my sister and K- are pretty well situated according to them, as they are, maybe a change in the future, but for mow, their families are complete. T- on the other hand is missing a piece of her family, a piece of her heart. T- always wanted kids, but she also knew that whether or not she had her own biological kids, she wanted to adopt. Soon after I wrote, edited and mailed a letter to Maryland, the home of the adoption agency. Surprisingly T- called me earlier this week and said the agency told her they never received my letter and the agency contact asked in an email “Does she know how to address an envelope?” Well, I can assure you I do! So I emailed her my letter. My email was returned undeliverable immediately. I had transposed two of the letters in the e-mail address…maybe I DON”T know how to address a real envelope! My mistake fixed I re-sent and received delivery confirmation. So that brings us to today. I wanted to share a few portions of the letter so you can see what amazing parents T and S already are, and you can think good thoughts as they embark on this exciting, long journey. Maybe my letter will help you if someone asks to write an adoption reference letter! There are so many things I wanted to point out, talk about, but I tried to make it concise. -- and again make it clear I am RECOMMENDING they be approved as prospective adoptive parents. I'm hoping by putting this out there lots of people will send good adoption vibes to the C's! Starting over hasn't been easy, but it's essential. I finally realized the things in my life that needed to change, and that I had control over most of them. I asked myself what good can I be to anyone else if I'm not taking care of myself? I can only control my four walls, and how I react to things outside those walls. That's the decision I made that day. Take care of me, no matter what. Now realize, we are talking mentally, there are plenty of physical ways that I could be taking care of myself better, and those will come in time. For now, sanity. Later, buns of steel. During my intense therapy I really started to hone in my creativity, something I had put on the back burner. This was one of the best things I could have done. Painting, sketching, taking photographs, and other endeavors have really been cathartic experiences for me. Next thing I know, I've enrolled in 2 classes for the upcoming semester at the local community college. It's so weird, I don't remember hemming and hawing, just that I sat down, browsed the catalog and picked two classes. Drawing and Principals of Psychology. Done and Done. I wish I could say everything was honky-dory from then on out, but come on, this is real-life. School was great, and hard, and great, and really, really hard! It took a great deal for me to make it to a 3 hour drawing class after a 14 hour day at work twice a week, it was a struggle to read hundreds of psych. articles and pages of cases, learn new lingo, and once again learn to and socialize with the other students I was in class with/am in class with. I navigated fairly well that first semester, juggling 60+hour a week work week, classes, and home. I thank my lucky stars my husband is supportive and generous, not once has he complained that the house is a wreck, that I don't spend enough time with him or that I'm not pulling my weight in this family/house/universe. Okay, time for some math homework and a chat with the MN side of the family. OHHHHHH MINNNNEEEESOOOOOTAAAAAAAAAAAAAAAAAAAAH! makes me a dull girl! Let me take a minute and fill you in on where I've been and what I've been up to! This semester has been really full! Just as I think I am going to fall flat on my face, another assignment comes along! So basically I am being propped up by books that need to be read, articles that need analyzing, paint that is still drying, labs that need testing and MATH, oh my word the math. For some reason I thought it would be a good idea to take 2 math classes congruently. Bad idea. Now these aren't crazy maths like real people take, these are maths for liberal arts majors, that's more than enough for me! When I graduated high school a hundred years ago, all of my friends knew what they were going to do, where they wanted to go and who they wanted to be. Yeah, right, I know NOW, none of that matters now for most of them, but at the time it was such a big deal. I'm sure now that there were other kids like me, who had NO IDEA WHAT THE HELL they were gonna do, I guess they just kept quiet. But it felt really lonely. So, I did what I thought I should do, enter college. All that got me was a couple of failed classes and a hangover. For me, entering college so unsure of myself made for a pretty miserable combination. For years I thought, heck, didn't work for me, no biggie. Then I started to get an itch. No! Not that itch, we'll talk about that later. A yearning for something new, bigger than myself and challenging. I'll tell you right now, managing how someone pours milk, or cooks a steak has it's days, but no real complexity or value at the end of my day. For years I talked myself out of going back to school, until the great breakdown of aught eight. I suddenly couldn't function properly, couldn't get out of bed, work was a disaster and I COULDN'T CONTROL THE CRYING! Oh lordy the crying! I went and checked myself in. I could go home at night, but for weeks the days belonged to a therapist and group. I felt like I only had one other option, and well, that one is the worst for everyone involved, so I chose to start over instead. Okay, gotta run and get to class--More to come. Copy of the letter written to Lab rescue, after they accepted, then rescinded their offer to take Mocha into their program with me as the foster dog mom. Got it. We'll start looking for a home for her. Thanks. 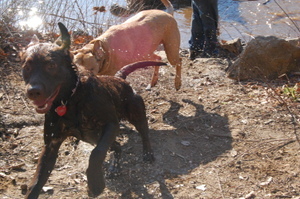 I have tried to work with XXXXXX to place a rescued, abused Labrador Retriever named Mocha. I realize Mocha has minor issues, but with the accepted faxed release form and the email cited above I expect you as a group to help us find a suitable home for this puppy. I have been honest with everything I have sent you about Mocha, and feel Mocha has been penalized for my honesty. Just because she isn't the 'perfect' dog you are going to deny her a great home? Now that does not sound like RESCUE, it sounds like doggy discrimination. She is not a vicious dog, is not aggressive, does not bite and would not harm anyone, therefore she deserves a chance. She needs help, she needs rescuing. It's not that I don't know how to help her, like Silvia insinuated in the previous email, with all of the obvious suggestions, it's that I can not keep her. When I took her in, and spoke with Silvia I told her I would foster the dog for a reasonable amount of time until a great home would be found. I have worked with other rescue leagues such as Mid-Atlantic Great Dane Rescue and never encountered an organization with such a myopic view of a salvageable dog. This isn't a situation where someone went out and got a dog and it is not 'working out'. I rescued her from an abusive situation, and now am coming to you for help. If you were me and saw the abuse, you couldn't have have turned a blind eye. I didn't. Portion of the mission statement directly from your web-site: "Lab Rescue of the Labrador Retriever Club of the Potomac is an all-volunteer, non-profit organization (Non-Profit Tax I.D. 52-1880024) with a two-fold mission: (1) we rescue, foster and place homeless, abused, and/or abandoned Labrador Retrievers (and Golden Retriever-Labrador Retriever mixes) ..."
Together we need to rescue Mocha and provide the best outcome for this dog. This group of people does not have every dogs best interest, they have their own interest in mind, and whatever is easiest. Since writing this letter I have received no reply, but really what can they say? I would suggest going through a different group before adopting from, or donating time and or money to this group.